2. As with the rest of the world, I'm ready for a fresh start after the first of the year. Health-wise, that is. I know where I want to be, I know what I'm capable of, I know what it's going to take to get there. Now all I have to do is really hold myself accountable, because I've been failing miserably for the last couple months. I know that it's the holiday season and we're all bound to be a bit more fluffy, but looking in the mirror and seeing the extra ten pounds I've gained since last year is getting a little old. Honestly. 3. Movies you need to see immediately: Everybody's Fine (I was borderline sobbing in the theatre, but it's a beautiful movie), Paper Heart (I adored this!) and Prancer (one of my favorite Christmas movies, which I somehow manage to not even own and am highly depressed about that fact). 4. I have a bunch of new items up in the shop if you feel the desire to take a gander. Since the holiday rush is over, it's been nice to have some time to focus my energy on stocking the shop with some new items. I'm also busy coming up with a plan to build my business in the coming year. Craft shows, photography prints, giveaways, custom items, invitations - yes, the creativity is flowing, indeed! I can't be stopped! Send help, cute buttons and a white chocolate mocha my way! Weeeee! 5. I need to write more. I keep feeling the urge, but when I sit down to write I feel all mixed up inside. I almost feel like I have less to say when things are going remarkably well. Isn't that a little ironic? I'm a big fan of messy buns as well. Also, I really would like to see Paper Heart! I'll take a messy bun with a side of yoga pants and a baby tee please. Love lounge wear, and it is also my attire of choice during the Holiday Season. My current dress code: comfy pants and my husband's sweatshirt over a tank top and fuzzy slippers, hair up in a ponytail (it is too short to put in a bun). HELLO WINTER! I am the exact same way with writing - when things are going well I don't have much to say. I struggle with what I want to write about. It's odd. I'm in yoga pants too. Ah well. PRANCER IS MY FAVORITE HOLIDAY MOVIE! 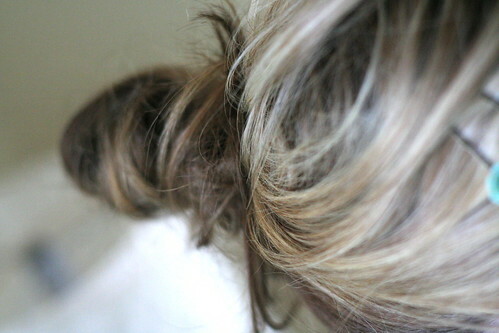 I love messy buns as well - they're just so ... easy. I really want to watch Everybody's fine - sounds like a great flick. Another film that I really, really want to see is 'The Blind Side' - I love Sandra Bullock in anything! I know what you mean about not being able to write when you're happy - it's so much easier to complain! What I sometimes do is ask myself a question or two on a topic that I've been thinking about and try to go with that. All the best with your fresh start for the new year and your expanding business! completely agree with the writing thing. The better things go in my life, the less I have to say about it - at least on my blog. It's weird, isn't it? I LOVE Prancer!! I was flipping through the channels and saw it on (though half over, poo) and was all "YAY Prancer!" and Cale gave me the weirdest look. "You never used to watch that movie did you?" Wow, I LOVE Prancer. The only copy I have is on an old, battered VHS tape that my husband complains about because it makes noise. Mmm, loungewear. except mine currently consists of disgusting leggings (they're... not normal cotton legging. They're something weird and too stretchy) and a tee that's probably eight sizes too big that I stole from a male friend in college. Also, old man slippers. Someday I'm gonna buy one of your wallets or those jar cards. Love 'em! How did you get into crafting? I'm pretty artsy but never quite know where to begin as far as buying supplies goes. Messy buns are the best...and probably the main reason I'm growing my hair out again. i am completely with you on the extra weight. i even wrote a letter to my winter weight on my blog on friday. bleh. getting excited for a new start. Fluffy. I love that euphemism! When it's this cold outside and cozy inside, it's difficult not to go into hibernation mode! Adorable new items in the shop, by the way! I always use messy buns, even for work! I kind of like it better than if it's slicked back. Messy buns really are the best. Love them and wear them most days, especially when I don't have time to do anything to my hair. I need to get with it on the health thing, too. I've been saying it for the past year but this new year? I've GOT to make a change. One for good. And one that will make me feel a lot healthier. I'm pretty much insanely jealous of anyone who can put their hair in a messy bun and have it not only look like you styled it that way, but also have it stay in place. If only I could master this fine art, my days would be a lot brighter. I LOVE messy buns. Looks awesome! White mochas are amazing-I just finished up one this morning! last week, I wore leggings and an oversized baseball tee (which I had also...um...slept in...) all day. We had to run to the grocery store, and I was worried I'd have to change, but, lo and behold, a long wool coat covers all! also, here's to writing more; one of my goals also, but it's a task that seems so elusive it's hard to start. easier to just bake more cookies. i have totally been rocking the leggings as pants and baggy tshirts look the past couple days and it was glorious. Found your blog through a link on Kaileen's blog. I so hear you on the holding oneself accountable. I think it's been a million years since I have gone to the gym/yoga. I love the feeling of wanting to write, that I sometimes just cling to the feeling without actually writing. I just love your blog. I am so thankful for you!! I always look forward to new posts and hope they keep coming! Thanks for giving me something to look forward to!! =) happy holidays!! I need a fresh start health-wise, too. I've gained 10 pounds over the past year and I dislike it very much. Wait, okay, so I'm awesome at the messy bun but I just realized I don't really know how to do a *real* bun. Adult lady fail? I don't write when my life seems to be just going...there isn't anything impressive to talk about. I think that's okay though...sometimes it is good just to enjoy life as you live it. Have a Merry Christmas! When I was younger my sister and I used to stay up late on Christmas Eve and watch Prancer. Such a wonderful Christmas movie. It brings back so many memories!